Jonny Sun, occasionally styled as jomny sun, is a Canadian author and illustrator. He is the author of illustrated novel everyone’s a aliebn when ur a aliebn too and a Ph.D. candidate in urban studies and planning at MIT. Sun is from Calgary and attended University of Toronto and the Yale School of Architecture. He is now a Ph.D. candidate in urban studies and planning at MIT. In June 2017, Sun published everyone’s a aliebn when ur a aliebn too. The illustrated novel is based on a character Sun developed on Twitter, tweeting as an alien trying to learn to navigate life among humans. He has said the period in which he was beginning graduate school, and the toll that took on his mental health, was the impetus for the project, with the character offering an opportunity to work through the isolation and depression he experienced. Sun's second book, a collaboration with musical playwright and actor Lin-Manuel Miranda, was released in October 2018. The book, called Gmorning, Gnite! Little Pep Talks For Me & You, is a collection of affirmations drawn from Miranda's Twitter feed and illustrated by Sun. The book spent ten weeks on the The New York Times Best Seller list. ^ "Open Call for Fellowship Applications, Academic Year 2018-2019". Berkman Klein Center - Harvard University. January 3, 2018. ^ Lichtenstein, Jesse (15 June 2017). "A Whimsical Wordsmith Charts a Course Beyond Twitter". The New York Times. Retrieved 6 July 2017. ^ "Jonathan Sun: 'I can only control so much in my life, and the rest will come as it happens'". The Globe and Mail. 23 June 2017. Retrieved 6 July 2017. ^ "Why Jonny Sun created an alien that helps us understand what it means to be human". CBC. June 27, 2017. Retrieved 6 July 2017. ^ a b Rindner, Grant (August 8, 2017). "Writer Jonathan Sun on translating the Weird Twitter experience for an IRL audience". Vox. Retrieved 2018-07-17. ^ Schwartz, Dana (30 December 2016). "15 (Okay, 16) Books to Look Forward to in 2017". New York Observer. Retrieved 6 July 2017. ^ Mertes, Micah (June 26, 2017). "Summer book preview: 13 must-reads". Omaha World-Herald. Retrieved 6 July 2017. ^ Lui, Samantha (January 11, 2017). "Twitter star Jonathan Sun's new bot wants to make sure you're doing OK". NBC News. Retrieved 6 July 2017. ^ Yin, Maryann (December 7, 2016). "Cover Revealed For Jonathan Sun's 'Aliebn' Book". GalleyCat. Retrieved 6 July 2017. ^ Derschowitz, Jessica (July 17, 2018). "Lin-Manuel Miranda's inspirational 'Gmorning, Gnite!' tweets getting their own book". Entertainment Weekly. Retrieved 2018-07-17. ^ "Advice, How-To & Miscellaneous Books - Best Sellers - January 6, 2019 - The New York Times". The New York Times. ISSN 0362-4331. Retrieved 2019-01-31. 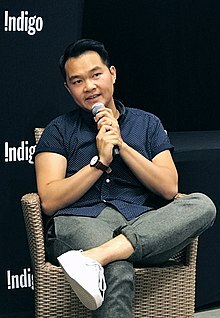 Wikimedia Commons has media related to Jonny Sun. This page was last edited on 24 April 2019, at 16:50 (UTC).